16 strings, 8 dancing feet and 4 voices with 1 aim: to make classical music wickedly funny and fantastically exhilarating. 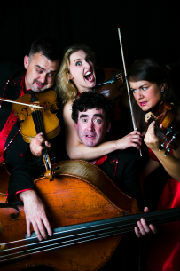 Graffiti Classics bursts the boundaries of the traditional String Quartet with its hilarious all-singing, all-dancing musical comedy cabaret show. It’s the opening concert in the Chamber Players 2016 season. Saturday 6th February. 7.00pm. All Saints church, West Dulwich, SE21 8JY. This concert will start at the earlier time of 7.00pm to enable families with children to attend also. This is a show suitable for all ages, and we hope that many families will take up the family discount offer.